Are Your Cooling (and/or Heating) Costs Out of Control? 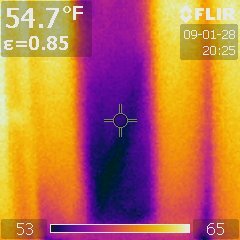 OxBow is a NACHI Certified Home Inspector who is also trained, licensed, and certified as a Thermographer. 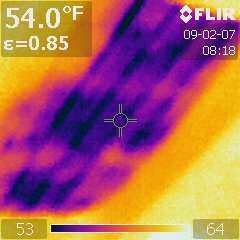 I will perform an energy efficiency inspection of your home. 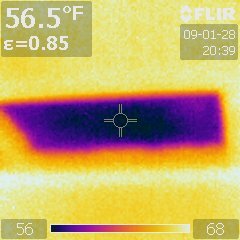 OxBow is also one of the very few Home Inspectors in all of Idaho to use state of the art digital Infrared Thermography (thermal imaging) in order to locate building performance deficiencies. This Energy Audit will allow you to bring today's energy efficiency to yesterday's home, and pay for it with tomorrow's energy savings. The picture on the left is a ceiling, as viewed from the inside of the living room. An area the size of two refrigerators was nearly void of insulation. Notice the temperature of this area (54F degrees). It is no wonder their furnace was staying on all the time. The photo in the center is of a stud bay that was missed, forgotten, or simply ignored... and then covered with sheetrock. 16 inches wide, and 8 feet tall. Besides... once the sheetrock is up... who will ever know? Until Infrared came along... the answer was "nobody would ever know". This is actually a fairly common little disaster that I see much more frequently than I should. The third photo: A new home. Almost a million dollars. This is the hatch leading into the attic. Daughter's room. She complained it was always cold. This hatch was sealed and painted shut. Before doing so... the builder forgot to insulate the hatch. Result: An area the size of a suitcase, radiating 56F degrees into her room. Another key to reducing your energy consumption is to do something about your windows: The weakest part of your thermal envelope. Please see this article regarding 'Thermal Shade". The OxBow Energy Audit can be used to obtain special low-interest FHA or other very special financing to help pay for the energy efficiency upgrades that are outlined in the report. An OxBow home energy audit can drastically lower your electric/propane/oil/gas bills; save power in Idaho; make your home more comfortable during all seasons, and help us all to lessen our dependence on foreign oil. Here is an example: We purchased our current home in 2002. The home is all electric, and is about 35 years old. The previous owner was on a "level pay" plan, and was paying $240 per month for utilities. After conducting my own energy audit and acting on each one of the recommendations, it added about $100/month to my mortgage as we had to finance the improvements. But... our monthly "level pay" electric bill is down: from $240/month to $74/month, and is still decreasing! So... we are paying about $100/month for the improvements, but have reduced our utility bill by $166/month! So, we have new appliances, new insulation, new windows, and numerous other improvements, along with a house that is much more comfortable and worth a lot more, and gained $66/month in the process! How Can a Home Energy Saving Audit Help? Find out which improvements to make. The energy audit report will estimate the costs involved and the projected savings of each repair, maintenance, or upgrade. The report will also show you how, and in how much time, your money saved on utility bills all by itself will pay for the costs incurred. as well as the IHINA and the NACHI Code of Ethics.